Durham, N.C. — These are hard times. In the midst of objectively worsening conditions for workers and the oppressed — that stem from the irresolvable crisis facing global capitalism — these hard times drive political consciousness and the level of struggle to new heights. Does it make you outraged that so many are unemployed, underemployed or working for poverty wages while Wall Street’s capitalists are reaping record profits? Does it make you sick that the U.S. spends more on wars and prisons than it does on education? Do you want to unite with others to fight against racist police brutality, vigilantes and a “justice” system that kills a Black or Brown youth in this country every 36 hours? Are you inspired by the Moral Monday movement and the fightback of low-wage workers? Do you want to be part of addressing the root causes of injustice? Then the upcoming “Hard Times Are Fighting Times: Building a Southern Movement for Revolution and Socialism Conference” is the place for you. 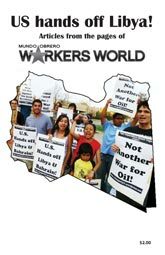 Hosted by the Durham Branch of Workers World Party, it takes place on Saturday, March 29, at the Durham County Main Library at 300 N. Roxboro St. in Durham, N.C.
Conference participants will grapple with the unique conditions facing the South and the growing fighback here. They will do it with an eye to building the struggle for a socialist society based on the needs of the 99%, not profits for the 1% — or to describe it from the viewpoint of revolutionary Marxism, for the needs of the working class, not the capitalists. The South is a region known for super-exploitation and national oppression. It is the stronghold of the racist Tea Party, and has a host of reactionary, anti-worker and bigoted laws on the books whose goal is to break solidarity and inhibit the ability to organize. Now the ruling class is exporting the South’s laws to other regions of the country, at the same time that many corporations are locating production in the South to maximize profits and drive down the working conditions of workers in other parts of the U.S. and around the globe. The left must take seriously the question of developing revolutionary consciousness and organizing in the South. It is also an incredibly exciting time, particularly in the South, with an upsurge in people’s movements and important victories in the struggle. Among these are the development of the Moral Monday movement and the election of Chokwe Lumumba in Jackson, Miss. The conference will take stock of these developments and how we can expand this momentum. In 2014 we mark the 90th anniversary of the death of Vladimir Lenin, the great Marxist theoretician and leader of the Bolshevik Revolution. Lenin made many important contributions to understanding the national question and the struggle for self-determination, the role of the state and the police in capitalist society, the development of imperialism, and the role of a revolutionary workers’ party in fighting for socialism. A major theme of the conference will be to discuss Lenin’s contributions and how they are applicable today. In plenaries and breakout discussions, the conference will use a pro-worker ideology and a revolutionary lens to analyze the most pressing political questions and struggles of the day. The conference will draw on the experiences, insights and creative thinking of the participants to look at these questions and collectively strategize about how to move forward. • Jerilyn Blueford, the mother of Alan Blueford, a young Black man who was murdered by the Bay Area Rapid Transit police in Oakland in 2009. • Lamont Lilly, a community organizer, people’s journalist and member of the Durham Branch of Workers World Party. • Teresa Gutierrez, co-coordinator of the May 1 Coalition for Worker and Immigrant Rights and a secretariat member of Workers World Party. • Eva Panjwani, a national organizer of Fight Imperialism, Stand Together and many more! Following the conference, there will be a hip-hop show featuring Jasiri X and other local artists, beginning at 10 p.m. If you have questions or things to share about why capitalism is not working for you, what is socialism and how we can build a movement for revolutionary change, and if you want to meet like-minded activists in the South, then you need to be at Workers World Party’s Hard Times Conference. Go to hardtimesconference.org to register, to download fliers and to see a full program for the day. Donations are also needed to help with conference expenses.